What about pets organizing and safety? Pets come in all sizes and kinds. According to the ASPCA regarding pet ownership, there are approximately 70-80 million dogs and 74-96 million cats owned in the U.S. What does this have to do with organizing? When organizing a home, sometimes the clutter is from our pets. Depending on what type of pets we have, we may have bird cages, pet toys, and food scattered throughout the house. Although, we love our furry and feathery friends, they usually do not pick up after themselves nor do they have a home for their items. We want to create homes for our pet’s items, whether it is food, toys and/or grooming tools. Additionally, we may medications that we administer to our pets that also need organizing. Some medications need to be refrigerated and others do not. It is also a good time to down-size a few toys if there’s an abundance. The excess toys can be donated or given to a friend that might have a pet. We want to spend quality time with our pets AKA “our babies” and not waste time looking for Fido’s favorite squeeze toy. Pets are analogous to children in many ways. We will discuss a few different products for organizing our pets. There are zillion choices out there, choose what fits your budget, style, space and function. When choosing an organizing product, ensure that will fit your space and all of the items that are to be stored. Doggy pet toys are a great example. Dog toys may need to be washed, mended or fit for regular chewing, drooling and chasing toys! 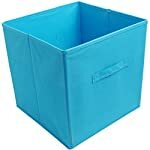 using a fabric storage drawer seen below that ranges from 5-$15. 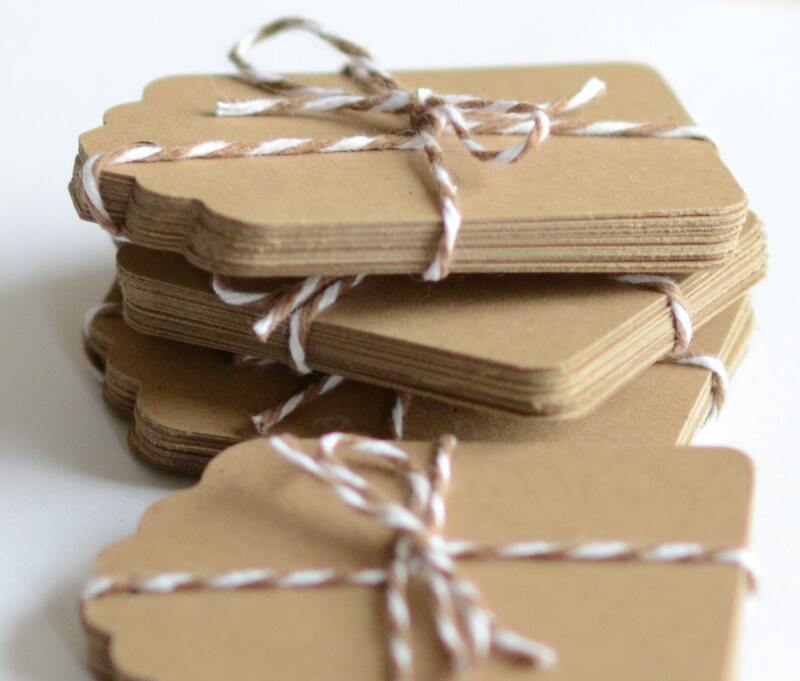 utilizing craft paper tags either the tying ones or untied ones. purchasing rectangle a BPA free cereal container to hold food for cats, birds, dogs or reptiles. and adhering Velcro to back of labels without strings. See above pictures for organizing ideas. What’s fun about this organizing task, there’s no limit in your creative imagination. 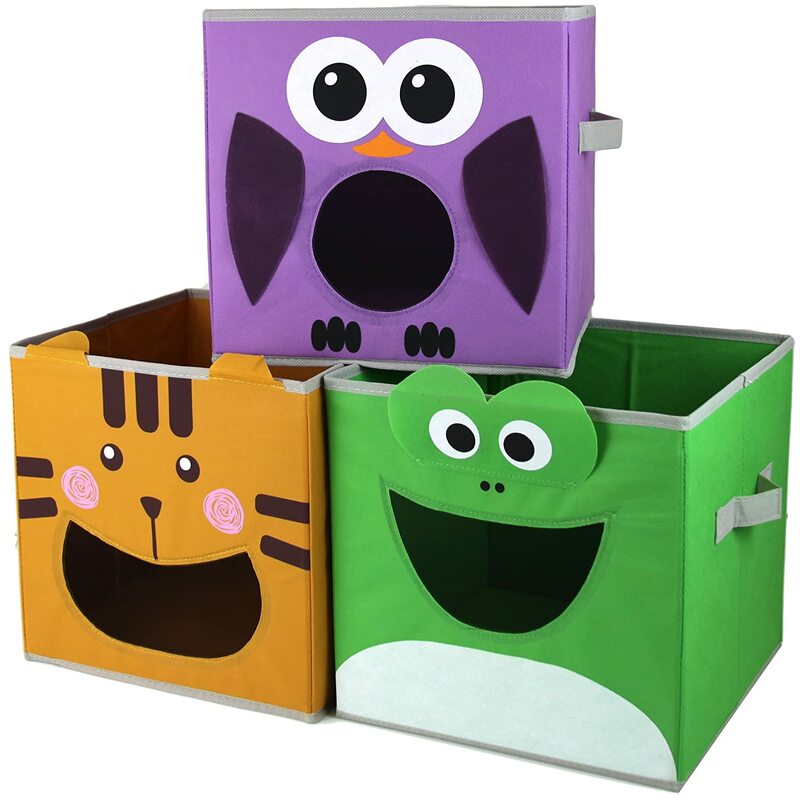 Looks at the kids storage containers featuring the bird, cat and frog which could also be used for pets if desired. It’s all about having fun while organizing! The large rectangular containers are from the Container store and are great for storing large quantities of pet food. 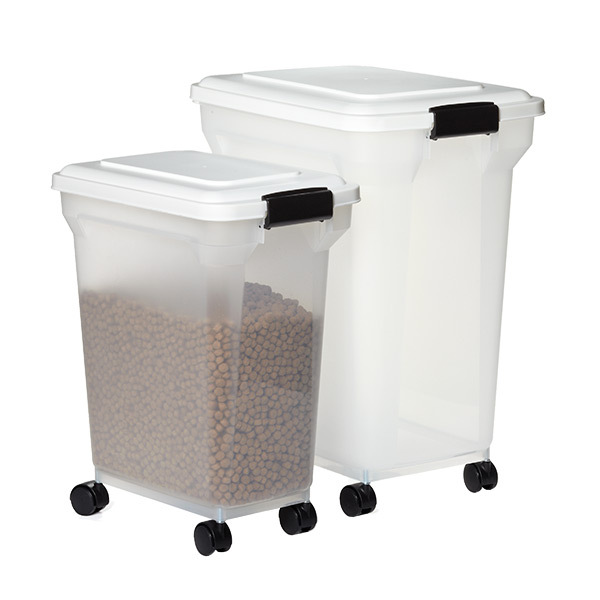 Containers without castors can also be purchased, but they may be smaller. Please note that if you are storing bird seed, it’s very important to keep it in a sealed air-tight lid, otherwise it will attract mice….unless a mouse is your pet. Next, pet safety is another organizing hot topic. When organizing a home, whether doing it by yourself or working with a professional organizer, pets are definitely paramount to the household. Additionally, when organizing we organize our where the pets supplies, food and toys go we need to ensure that our pets are safe. Perhaps, a mischievous kitty named Mr. Snuggles is sniffing an Easter Lilly plant which is very deadly for cats. If it’s an indoor pet and we are organizing spaces, we have to ensure that if our pets do not get into items they are not supposed to get into or escape outside into the perils of the outside world. Please refer the link Pet Poison Helpline and Info for a poison website and helpline for pets in the US and Canada. Obviously, it’s free to use website, but please note it cost $49 to ask about an emergency incident over the phone. The website has a lot of free and useful information. Well, after all of this hard, but fun organizing work….it is time to relax. Are you done organizing, so we can snuggle? Nothing is more satisfying for me than helping people overcome the distressing and overwhelming feelings that come from being buried in clutter, and see them find piece of mind and success. 2 Responses to What about pets, organizing and safety? Wow. Thank you for this great information. You have so many ideas. I hadn’t thought of how square containers are better for organizing. But, now that you mention it … they sure are. Thank you Mary Ann for commenting. I am glad you like this post!